Easton is the easternmost city in the Lehigh Valley, a region of 731 square miles (1,893 km²) that is home to more than 800,000 people. Together with Allentown and Bethlehem, the Valley embraces the Allentown-Bethlehem-Easton metropolitan area, including Lehigh, Northampton, and Carbon counties within Pennsylvania, and Warren County in the adjacent state of New Jersey. 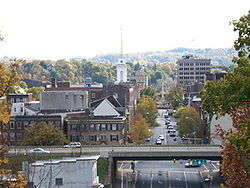 Easton is the smallest of the three Lehigh Valley cities, with approximately one-fourth of the population of the largest Lehigh Valley city, Allentown. In turn, this metropolitan area comprises Pennsylvania's third-largest metropolitan area and the state's largest and most populous contribution to the greater New York City metropolitan area. The city is split up into four sections: Historic Downtown, which lies directly to the north of the Lehigh River, to the west of the Delaware River, continuing west to Sixth Street; The West Ward, which lies between Sixth and Fifteenth Streets; The South Side, which lies south of the Lehigh River; and College Hill, a neighborhood on the hills to the north which is the home of Lafayette College. The boroughs of Wilson, West Easton, and Glendon are also directly adjacent to the city; the first and largest of which, Wilson, partially aligns in the same North-South Grid as the city of Easton. The greater Easton area consists of the city, three townships (Forks, Palmer, and Williams), and three boroughs (Glendon, West Easton, and Wilson). Centre Square, the town square of the city's Downtown neighborhood, is home to the Soldiers' & Sailors' Monument, a memorial for Easton area veterans killed during the American Civil War. The Peace Candle, a candle-like structure, is assembled and disassembled every year atop the Civil War monument for the Christmas season. The Lenape Native Americans originally referred to the area as "Lechauwitank", or "The Place at the Forks". The site of the future city was part of the land obtained from the Delawares by the Walking Purchase. Thomas Penn set aside a 1,000 acres (4.0 km2) tract of land at the confluence of the Lehigh and Delaware rivers for a town. Easton was settled by Europeans in 1739 and founded in 1752, and was so named at the request of Penn; he had recently married Juliana Fermor, the daughter of Lord Pomfret whose estate was called Easton Neston, near Towcester, Northamptonshire, England. As Northampton County was being formed at this time, Easton was selected as its county seat. During the French and Indian War, the Treaty of Easton was signed here by the British colonial government of the Province of Pennsylvania and the Native American tribes in the Ohio Country, including the Shawnee and Lenape. Easton was an important military center during the American Revolutionary War. During the Revolutionary War, Easton had a military hospital. On 18 June 1779, General John Sullivan led 2,500 Continentals from Easton to engage British Indian allies on the frontier. On Easton was one of the first three places the Declaration of Independence was publicly read (along with Philadelphia and Trenton). It is claimed that the Easton flag was flown during that reading, making it one of the first "Stars and Stripes" to fly over the colonies. This flag, which is known to date to the War of 1812, currently serves as Easton's municipal flag. Easton was a major commercial center during the canal and railroad periods of the 19th century, when it was a transportation hub for the steel industry. Three canals, the Delaware, the Lehigh, and the Morris, served to connect the coal regions to the north and west, the iron works to the west, the commercial port of Philadelphia to the south, and the New York City area to the east via a connection with the Morris Canal across the Delaware River in Phillipsburg, New Jersey. When canal transportation was largely replaced by railroads, Easton was served by five railroads, and only lost its prominence in transportation with the rise of the automobile in the mid-20th century. Like the Pennsylvania Dutch region to the southwest, Easton has a strong German heritage. The Pennsylvania Argus, a German-language newspaper, was published in Easton until 1917. As part of their heritage, the Germans put up one of the continent's earliest Christmas trees in Easton; Daniel Foley's book states that "Another diary reference unearthed recently makes mention of a tree set-up at Easton, Pennsylvania, in 1816." There is a plaque in Scott Park (along the Delaware River) commemorating this event. Historians of angling believe that Samuel Phillipe, an Easton gunsmith, invented the six-strip split-cane Bamboo fly rod. A Pennsylvania Historical and Museum Commission plaque near Center Square commemorates this event. Easton is located at 40°41′18″N 75°12′59″W﻿ / ﻿40.68833, -75.21639 (40.688248, −75.216458). According to the United States Census Bureau, the city has a total area of 4.7 square miles (12 km2), of which, 4.3 square miles (11 km2) is land and 0.4 square miles (1.0 km2) (8.39%) is water, including Bushkill Creek and the Lehigh and Delaware rivers. Downtown Easton lies at the confluence of the Lehigh River and Delaware River and is a low-lying area surrounded by hills to the north, west, and south. North of downtown is College Hill, the home of Lafayette College. South Easton, divided by the Lehigh River from the rest of the city, was a separate borough until 1898; it was settled initially by Native Americans, later by canal workers, and then was later the home of several silk mills. As of the 2010 census, the city was 67.2% White, 16.8% Black or African American, 0.4% Native American, 2.4% Asian, 0.1% Native Hawaiian, and 4.9% were two or more races. 19.9% of the population were of Hispanic or Latino ancestry. As of the census of 2000, there were 26,263 people, 9,544 households, and 5,735 families residing in the city. The population density was 6,168.4 per square mile (2,380.3/km²). There were 10,545 housing units at an average density of 2,476.7 per square mile (955.7/km²). The racial makeup of the city was 78.48% White, 12.71% African American, 0.24% Native American, 1.66% Asian, 0.11% Pacific Islander, 3.67% from other races, and 3.13% from two or more races. Hispanic or Latino of any race were 9.79% of the population. The increase in Hispanic/Latinos—from less than 10% of the population in the 2000 census, to nearly 20% in the 2010 census, is a significant change in the city's demographics. The growth in Hispanic residents is similar to increases in Allentown and Bethlehem, the two other major cities in the Lehigh Valley. There were 9,544 households out of which 30.5% had children under the age of 18 living with them, 37.7% were married couples living together, 16.6% had a female householder with no husband present, and 39.9% were non-families. 31.5% of all households were made up of individuals and 11.0% had someone living alone who was 65 years of age or older. The average household size was 2.46 and the average family size was 3.10. In the city the population was spread out with 23.3% under the age of 18, 16.3% from 18 to 24, 29.9% from 25 to 44, 18.6% from 45 to 64, and 11.9% who were 65 years of age or older. The median age was 32 years. For every 100 females there were 97.4 males. For every 100 females age 18 and over, there were 96.1 males. * Number of reported crimes per 100,000 population. The median income for a household in the city was $33,162, and the median income for a family was $38,704. Males had a median income of $32,356 versus $23,609 for females. The per capita income for the city was $15,949. About 12.3% of families and 16.0% of the population were below the poverty line, including 21.3% of those under age 18 and 11.2% of those age 65 or over. Easton operates a mayor-in-council city government. Residents elect a city controller, six city councilpersons and a mayor who is also a voting member of the city council. All of these officials are elected to four-year terms. The incumbent mayor, Democrat Sal Panto, Jr., was re-elected to his second consecutive term in 2011; he had previously served two terms as mayor during the 1980s. Easton is part of Pennsylvania's 17th congressional district, represented in the United States House of Representatives by Democrat Matt Cartwright, first elected to this office in 2012. The Easton Area School District serves the residents of the city of Easton along with Forks and Palmer Townships and two smaller non-contiguous communities: the borough of Riegelsville to the south and the village of Martins Creek to the north. As of the 2000 census, the combined population of the municipalities in the Easton Area School District was 53,554. The school district has seven elementary schools (Cheston, Forks, March, Palmer, Paxinosa, Shawnee and Tracy) for grades K-4, Easton Area Middle School Campus (in Forks Township) for grades 5–8, and Easton Area High School (in Palmer Township) for grades 9–12. Total student enrollment is about 9000 students in all grades. Easton Area High School is known for its long-standing athletic rivalry with Phillipsburg High School in neighboring Phillipsburg, New Jersey. The two teams play an annual football game on Thanksgiving Day that is considered one of the largest and longest-standing rivalries in American high school football. 2006 marked the 100th year anniversary of the Easton-Phillipsburg high school football rivalry The game, which was shown on ESPN, was won by Easton. In 2009, Easton was the location of the Gatorade REPLAY Game in which the 1993 teams from the Easton vs. P-Burg Game met again to resolve the game, which ended in a 7–7 tie. The REPLAY Game was won by Phillipsburg, 27-12. Easton Area High School athletes compete in the Lehigh Valley Conference, which consists of the 12 largest high schools in the Lehigh Valley. Easton holds the third most LVIAC championships in all sports, behind only Parkland High School and Emmaus High School. Easton is also home to Catholic Notre Dame High School. Easton is the home of one four-year college, Lafayette College, which was established in 1826. Easton's Two Rivers Landing is the home of two interactive children's museums, the National Canal Museum, which focuses on the importance of canals in the region, and the Crayola Factory, which is owned by Crayola LLC (formerly known as Binney & Smith), a major toy manufacturer based in nearby Forks Township. The global headquarters for Victaulic is also based in nearby Forks Township. The city was also once the home of Dixie Cup Corporation, the manufacturer of Dixie Cups and other consumer products. Majestic Athletic, current provider of uniforms for Major League Baseball, is based in Easton. Easton's daily newspaper is The Express-Times. The Morning Call, based in Allentown, also is widely read in the city. Easton is part of the Philadelphia DMA, but also receives numerous radio and television channels from New York City, as well as the smaller Scranton-Wilkes-Barre media market to the northwest. Two television stations are based the Easton area: PBS affiliate WLVT Channel 39 in Bethlehem, and independent station WFMZ Channel 69 in Allentown. Four radio stations are based in Easton: WEEX, a sports radio station broadcasting at 1230 AM, WODE-FM "The Hawk", a classic rock station broadcasting at 99.9 FM, WCTO "Cat Country 96," a country music station broadcasting on 96.1 FM, and WJRH, a Lafayette College radio station broadcasting at 104.9 FM. In addition, WDIY-FM, a National Public Radio affiliate located in Bethlehem, maintains a translator in Easton broadcasting at 93.9 FM. Easton was once served only by the 215 area code from 1947 (when the North American Numbering Plan of the Bell System went into effect) until 1994. In response to southeastern Pennsylvania's growing telecommunication demand, Easton telephones exchanges were switched to area code 610 in 1994. An overlay area code, 484, was added to the 610 service area in 1999. Easton is served by I-78, US 22, PA 33, PA 248 and PA 611. Trans-Bridge Lines provides regular bus service to New York City. Air transport to and from Easton is available through Lehigh Valley International Airport, which is located approximately 15 miles (24 km) west of the city, in Hanover Township. Bus transportation is provided by LANTA Metro bus services. Easton has no passenger rail service. Until 1983 New Jersey Transit's Raritan Valley Line terminated at Phillipsburg, New Jersey, on the other side of the Delaware River from Easton. The line now stops at High Bridge, New Jersey, roughly 20 miles (32 km) to the east. Under NJT's I-78 Corridor study this service would be restored. Allen C Laros – 31 May 1876 added arsenic to family coffee pot and poisoned his father, Martin Laros, his mother, and a hired hand. ^ "Population Finder: Easton, Pennsylvania". U.S. Census Bureau. http://factfinder.census.gov/servlet/SAFFPopulation?_event=ChangeGeoContext&geo_id=16000US4221648&_geoContext=01000US%7C04000US42%7C16000US4206088&_street=&_county=easton&_cityTown=easton&_state=04000US42&_zip=&_lang=en&_sse=on&ActiveGeoDiv=geoSelect&_useEV=&pctxt=fph&pgsl=010&_submenuId=population_0&ds_name=null&_ci_nbr=null&qr_name=null&reg=null%3Anull&_keyword=&_industry=. Retrieved 2009-10-28. ^ (1991) "International Brotherhood of Electrical Workers". IBEW Journal 90. ^ "Easton (Pennsylvania, United States) - Britannica Online Encyclopedia". Britannica.com. http://www.britannica.com/EBchecked/topic/177467/Easton. Retrieved 2012-06-23. ^ "Northampton County – 4th class". Pennsylvania Historical and Museum Commission. http://www.phmc.state.pa.us/bah/dam/counties/pdfs/Northampton.pdf. Retrieved 2007-06-03. ^ John C. Fitzpatrick, The Writings of George Washington from the Original Manuscript Sources, 1745-1799, 39 vols. (Washington, D.C., 1931-1944), 6: 327-328. ^ "Easton Heritage Day". heritageday.org. http://www.heritageday.org. ^ Foley, Daniel J. (1960). The Christmas Tree. Philadelphia: Chilton Co., Book Division. p. 72. ^ Herd, Dr. Andrew N. (2005). "Sammuel Phillipe". A Fly Fishing History. http://www.flyfishinghistory.com/phillipe.htm. Retrieved 5 November 2009. ^ "1940 Census - Census of Population and Housing - U.S. Census Bureau". Census.gov. http://www.census.gov/prod/www/abs/decennial/1940.html. Retrieved 2012-06-23. ^ "1960 Census of Population and Housing". Census.gov. 2012-05-25. http://www.census.gov/prod/www/abs/decennial/1960cenpopv1.html. Retrieved 2012-06-23. ^ "1990 Census of Population and Housing". Census.gov. http://www.census.gov/prod/cen1990/cph2/cph-2-1-1.pdf. Retrieved 2013-07-23. ^ "Census 2010: Pennsylvania". Usatoday.Com. http://www.usatoday.com/news/nation/census/profile/PA. Retrieved 2012-06-23. ^ "City of Easton - City Government - Elected Officials". http://www.easton-pa.com/elected.html. Retrieved July 23, 2013. ^ "City of Easton Home Rule Charter". http://www.easton-pa.com/geninfo/citycharter.pdf. Retrieved July 23, 2013. ^ "Easton Voters Choose Panto Again". November 9, 2011. http://easton.patch.com/groups/politics-and-elections/p/easton-voters-choose-panto-again. Retrieved July 23, 2013. ^ a b Erik Brady (2006-11-23). "Every year fields the game of the century". USA Today. http://www.usatoday.com/sports/preps/football/2006-11-21-1a-cover-centenary-game_x.htm. Retrieved 2007-05-29. ^ Conover, Allan (April 29, 2009). "Phillipsburg beats Easton in Gatorade Replay football". Warren Reporter (Phillipsburg, NJ). http://www.nj.com/warrenreporter/index.ssf/2009/04/phillipsburg_beats_easton_in_g.html. Retrieved 13 August 2010. ^ "LVIAC Past Champions". Lehigh Valley Interscholastic Athletic Conference. http://www.lviac.net/pdf/pastchampions.pdf. Retrieved 2010-08-13. ^ Garret, Robert (August 11, 1980). "Good Night Judge Crater, Wherever you Are...". New York Magazine 13 (11): 11–12. ISSN 0028-7369. Retrieved on January 21, 2011. ^ Charles Sitgreaves, Biographical Directory of the United States Congress. Accessed August 18, 2007. ^ "Riverside Festival of the Arts". Riverside Festival of the Arts Website. Arts Community of Easton. http://www.eastonriversidefest.com/. Retrieved 2011-08-14. ^ "Welcome". Easton Garlic Festival Website. Easton Garlic Festival. http://www.eastongarlicfest.com/. Retrieved 2010-10-05. ^ "Easton Heritage Day". Easton Heritage Day. Heritage Day. http://www.heritageday.org/. Retrieved 2011-02-14. Wikisource has the text of the 1911 Encyclopædia Britannica article Easton. Easton travel guide from Wikivoyage. Easton news at Lehigh Valley Live. What's Happening in ... eastoNOW. "Easton Heritage Day History". heritageday.org. date unknown. http://www.heritageday.org/. Retrieved 7 July 2009. The Arts Community of Easton. This page uses content from the English language Wikipedia. The original content was at Easton, Pennsylvania. The list of authors can be seen in the page history. As with this Familypedia wiki, the content of Wikipedia is available under the Creative Commons License.